Kenji Miyazawa (1896-1933) is one of Japan's most beloved writers and poets, known particularly for his sensitive and symbolist children's fiction. This volume collects stories that focus on Miyazawa's love of space and his use of the galaxy as a metaphor for the concepts of purity, self-sacrifice, and faith, which were near and dear to his heart. "The Nighthawk Star" follows a lowly bird as he struggles to transform himself into something greater: a constellation in the night sky. "Signal and Signal-less" depicts a pair of star-crossed train signals who dream of eloping to the moon. 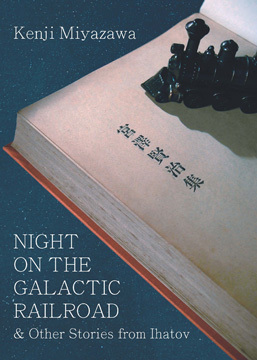 "Night on the Galactic Railroad," Miyazawa's most famous work, tells the story of two boys as they journey on a train that traverses the Milky Way, learning the true meaning of friendship, happiness, and life itself along the way. Kenji Miyazawa, born in the northern prefecture of Iwate in 1896, is one of Japan's most influential and well-loved authors. Despite not being well known in his lifetime, his pure-hearted and deeply romantic works continue to touch the hearts of readers eighty years after his death. Born the eldest son of a wealthy pawnbroker, Miyazawa, from an early age, was disconcerted by what he saw as his family taking advantage of the poor farmers who made up much of the population of Iwate. His strong convictions led him to eventually forgo his inheritance and leave the family business to his younger brother in order to pursue his own path in life. Penning children's stories and prose on the side, Miyazawa worked first as a teacher and then as the head of an association geared toward educating the same farmers he held in such high regard. Operating out of a detached house in the countryside that belonged to his family, Miyazawa lived a simple life that was rich in terms of his pursuit of beauty and knowledge, as well as the connection it afforded him to the people and the land to which he was devoted. In fact, his birthplace of Iwate was so dear to him that it appears in his writing as the fictitious land of Ihatov. Miyazawa had a great respect for religion, especially for the Buddhism he actively practiced and Catholicism with its emphasis on the virtues of charity and devotion. He also possessed an avid interest in science and mathematics, which perfectly complemented his spirituality. His work as a geologist spoke of his respect for nature, but he was just as intrigued with astronomy and space, which is depicted in his work not as a cold vacuum but as an emotional landscape. Perhaps Miyazawa's most defining trait, however, was his deep sense of openness and goodwill toward his fellow man. Miyazawa believed happiness could be achieved in service toward others, and it is this that led him to study the universal language of Esperanto, into which he strived to translate much of his writing. Of the many themes Miyazawa touched upon in his work, one that stands out is that of death. He effectively illustrated the spiritual impact of loss, undoubtedly influenced by losing his beloved younger sister to illness. Miyazawa himself would suffer health problems throughout his life, eventually succumbing to pneumonia in 1933, at the young age of thirty-seven. "Night on the Galactic Railroad," perhaps his most famous work, would be published posthumously the following year.